EpiQuik DNMT activity and inhibition colorimetric assay: (a) High sensitivity and specificity achieved by using recombinant DNMT1 with the EpiQuik DNMT Activity/Inhibition Assay Ultra Kit (Colorimetric); (b) High sensitivity and specificity achieved by using nuclear extract with the EpiQuik DNMT Activity/Inhibition Assay Ultra Kit (Colorimetric). Nuclear extracts were prepared from MCF-7 cells using the EpiQuik Nuclear Extraction Kit (Cat. No. OP-0002). Schematic procedure for the EpiQuik™ DNMT Activity/Inhibition Assay Ultra Kit (Colorimetric). The ultra-sensitive detection limit can be as low as 0.5 µg of nuclear extract or 0.5 ng of purified enzymes, which is five times better than the predecessor kit. Optimized antibody & enhancer solutions allow high specificity to 5-mC without cross-reactivity to unmethylated cytosine. 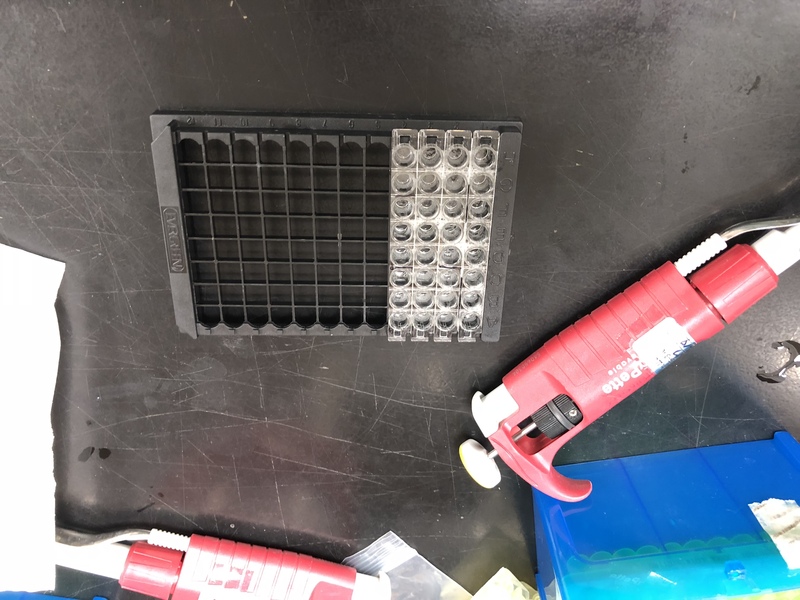 Strip-well microplate format allows for either low or high throughput analysis. The addition of methyl groups is carried out by a family of enzymes, DNA methyltransferases (DNMTs or DNA MTases). Chromatin structure in the vicinity of gene promoters also affects DNA methylation and transcriptional activity. DNMT1, DNMT3A, and DNMT3B are required for the establishment and maintenance of DNA methylation patterns. Two additional enzymes, DNMT2/TRDMT1 and DNMT3L, may also have more specialized but related functions. DNMT1 appears to be responsible for maintenance of established patterns of DNA methylation, while DNMT3A and 3B seem to mediate establishment of new or de novo, DNA methylation patterns. DNMT2/TRDMT1 was shown to methylate tRNAAsp at C38 and DNMT3L is found to be a catalytically inactive regulatory factor of DNA methyltransferases, which is essential for the function of DNMT3A and DNMT3B. Diseased cells such as cancer cells may be different in that DNMT1 alone is not responsible for maintaining abnormal gene hypermethylation and both DNMT1 and DNMT3B may cooperate with this function. Fig. 2. EpiQuik DNMT activity and inhibition colorimetric assay: (a) High sensitivity and specificity achieved by using recombinant DNMT1 with the EpiQuik DNMT Activity/Inhibition Assay Ultra Kit (Colorimetric); (b) High sensitivity and specificity achieved by using nuclear extract with the EpiQuik DNMT Activity/Inhibition Assay Ultra Kit (Colorimetric). Nuclear extracts were prepared from MCF-7 cells using the EpiQuik Nuclear Extraction Kit (Cat. No. OP-0002). In the non-radioactive assay with this kit, a universal DNMT substrate is stably coated onto the wells. DNMT enzymes transfer methyl groups to cytosines from Adomet to methylate the DNA substrate. The methylated DNA can be recognized with an anti-5-methylcytosine antibody. The ratio or amount of methylated DNA, which is proportional to the enzyme activity, can then be colorimetrically measured through an ELISA-like reaction by reading the absorbance in a microplate spectrophotometer at a wavelength of 450 nm. The activity of DNMT enzymes is proportional to the intensity of optical density measured. The entire colorimetric assay has easy-to-follow steps for convenience and speed, which can be completed in 3 hours and 45 minutes. The stripwell microplate format allows for a flexible assay in manual or high throughput analysis. All the needed reagents, including negative controls and positive controls, for measurement of DNMT activity/inhibition are conveniently packaged in the kit. The direct colorimetric quantification of DNA samples replaces obsolete or inferior methods and eliminates the need for radioactivity, extraction, or chromatography. The novel procedure and proprietary kit compositions allow for an accurate measurement of DNMT activity/inhibition to be achieved with high sensitivity and specificity. 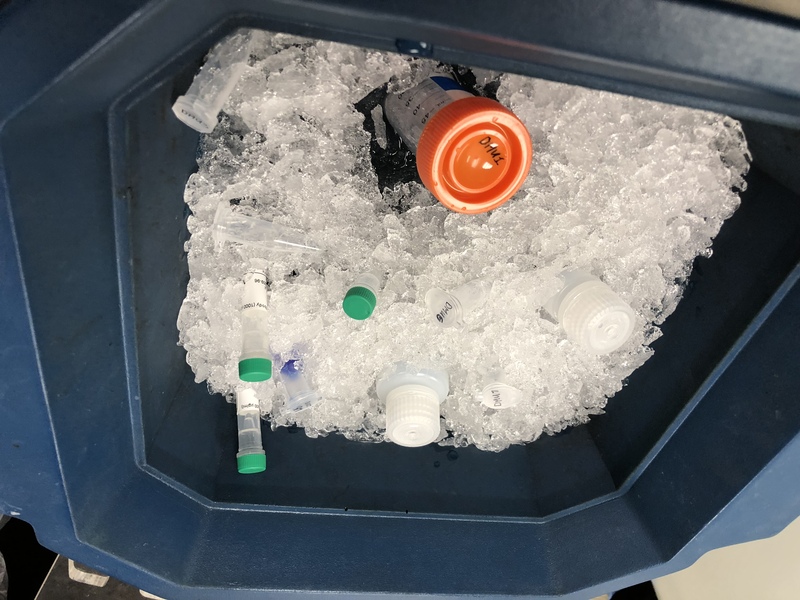 The detection limit of the input DNA can be as low as 0.5 µg of nuclear extract or 0.5 ng of purified enzymes, which is five times better than the predecessor kit. Tian XL et. al. (May 2019). Potassium bisperoxo (1,10-phenanthroline) oxovanadate suppresses proliferation of hippocampal neuronal cell lines by increasing DNA methyltransferases. Neural Regen Res. 14(5):826-833. Mondal NK et. al. (November 2018). Tetrahydrocurcumin epigenetically mitigates mitochondrial dysfunction in brain vasculature during ischemic stroke. Neurochem Int. 122:120-138. Zhang M et. al. (November 2018). Involvement of nerve growth factor in mouse hippocampal neuronal cell line (HT22) differentiation and underlying role of DNA methyltransferases. J Toxicol Environ Health A. 81(21):1116-1122. Yang Z et. al. (November 2018). Effects of Cyclocarya paliurus polysaccharide on lipid metabolism-related genes DNA methylation in rats. Int J Biol Macromol. 123:343-349. Kwak J et. al. (September 2018). Hepatitis C Virus Core Protein Activates p53 to Inhibit E6-associated Protein Expression via Promoter Hypermethylation . 28(9):1007-1015. Anier K et. al. (June 2018). Cocaine-induced epigenetic DNA modification in mouse addiction-specific and non-specific tissues. Neuropharmacology. Luo X et. al. (May 2018). DNMT1 mediates metabolic reprogramming induced by Epstein-Barr virus latent membrane protein 1 and reversed by grifolin in nasopharyngeal carcinoma. Cell Death Dis. 9(6):619. Xu Y et. al. (May 2018). S-allylcysteine suppresses ovarian cancer cell proliferation by DNA methylation through DNMT1. J Ovarian Res. 11(1):39. Zhang L et al. et. al. (March 2018). Inhibition of DNMT suppresses the stemness of colorectal cancer cells through down-regulating Wnt signaling pathway Cellular Signaling. George AK et. al. (March 2018). Exercise Mitigates Alcohol Induced Endoplasmic Reticulum Stress Mediated Cognitive Impairment through ATF6-Herp Signaling. Sci Rep. 8(1):5158. Li W et. al. (December 2017). Curcumin Derivative Epigenetically Reactivates Nrf2 Antioxidative Stress Signaling in Mouse Prostate Cancer TRAMP C1 Cells. Chem Res Toxicol. Nanduri J et. al. (November 2017). DNA methylation in the central and efferent limbs of the chemo reflex requires carotid body neural activity. J Physiol. Carden T et. al. (October 2017). Epigenetic modification of miR-663 controls mitochondria-to-nucleus retrograde signaling and tumor progression. J Biol Chem. Fu S et. al. (September 2017). 5-Aza-2'-deoxycytidine induces human Tenon's capsule fibroblasts differentiation and fibrosis by up-regulating TGF-β type I receptor. Exp Eye Res. Wirbisky-Hershberger SE et. al. (August 2017). Atrazine exposure decreases the activity of DNMTs, global DNA methylation levels, and dnmt expression. Food Chem Toxicol. Li et. al. (August 2017). Effects of dietary l-methionine supplementation on the growth performance, carcass characteristics, meat quality, and muscular antioxidant capacity and myogenic gene expression in low birth weight pigs J. Anim. Sci..
Xu H et. al. (May 2017). DNMT1 regulates IL-6- and TGF-β1-induced epithelial mesenchymal transition in prostate epithelial cells. Eur J Histochem. 61(2):2775. Yin J et. al. (April 2017). Acylamino acid chiral fungicides on toxiciepigenetics in lambda DNA methylation. Food Chem Toxicol. Fan Yang et. al. (December 2016). Casticin inhibits the activity of transcription factor Sp1 and the methylation of RECK in MGC803 gastric cancer cells Experimental and Therapeutic Medicine. 13(2):745-750. Sanchez OF et. al. (December 2016). Lead (Pb) exposure reduces global DNA methylation level by non-competitive inhibition and alteration of dnmt expression. Metallomics. Poh WJ et. al. (January 2016). DNA Methyltransferase Activity Assays: Advances and Challenges Theranostics. 6(3):369-391. Sun R et. al. (November 2015). Deoxyribonucleic acid (DNA) methyltransferase contributes to p16 promoter CpG island methylation in lung adenocarcinoma with smoking Int J Clin Exp Med. 8(9):15773-15779. Naselli F et. al. (October 2015). Phytochemical Indicaxanthin Inhibits Colon Cancer Cell Growth and Affects the DNA Methylation Status by Influencing Epigenetically Modifying Enzyme Expression and Activity. J Nutrigenet Nutrigenomics. 8(3):114-27. Pushpakumar S et. al. (July 2015). DNA hypermethylation in hyperhomocysteinemia contributes to abnormal extracellular matrix metabolism in the kidney. FASEB J.
Li JJ et. al. (June 2015). Homocysteine Triggers Inflammatory Responses in Macrophages through Inhibiting CSE-H2S Signaling via DNA Hypermethylation of CSE Promoter. Int J Mol Sci. 16(6):12560-12577. Pathania R et. al. (April 2015). DNMT1 is essential for mammary and cancer stem cell maintenance and tumorigenesis. Nat Commun. 6:6910. Zeng F et. al. (March 2015). Dynamic change of DNA methylation and cell redox state at different micropropagation phases in birch. Trees. :1-14. Cho SH et. al. (January 2015). SIRT1 deficiency in microglia contributes to cognitive decline in aging and neurodegeneration via epigenetic regulation of IL-1β. J Neurosci. 35(2):807-18. Cheng C et. al. (December 2014). 'Default' generated neonatal regulatory T cells are hypomethylated at conserved non-coding sequence 2 and promote long-term cardiac allograft survival. Immunology. 143(4):618-30. Zhang S et. al. (December 2014). The Effect of Hypoxia Preconditioning on DNA Methyltransferase and PP1γ in Hippocampus of Hypoxia Preconditioned Mice. High Alt Med Biol. 15(4):483-90. Cardenas H et. al. (November 2014). TGF-β induces global changes in DNA methylation during the epithelial-to-mesenchymal transition in ovarian cancer cells. Epigenetics. Choi YW et. al. (November 2014). B-RafV600E inhibits sodium iodide symporter expression via regulation of DNA methyltransferase 1. Exp Mol Med. 46:e120. Pudenz M et. al. (October 2014). Impact of soy isoflavones on the epigenome in cancer prevention. Nutrients. 6(10):4218-72. Zhu Y et. al. (September 2014). Placental mesenchymal stem cells of fetal origin deposit epigenetic alterations during long-term culture under serum-free condition. Expert Opin Biol Ther. :1-18. Lai J et. al. (August 2014). Transcriptional regulation of the p73 gene by Nrf-2 and promoter CpG methylation in human breast cancer. Oncotarget. 5(16):6909-22. Park J et. al. (April 2014). Hepatitis C virus represses E-cadherin expression via DNA methylation to induce epithelial to mesenchymal transition in human hepatocytes. Biochem Biophys Res Commun. 446(2):561-7. Lin N et. al. (April 2014). Homocysteine induces cytotoxicity and proliferation inhibition in neural stem cells via DNA methylation in vitro. FEBS J. 281(8):2088-96. Wang Y et. al. (March 2014). Ras-induced epigenetic inactivation of Ras-related associated with diabetes gene (RRAD) promotes glucose uptake in a human ovarian cancer model. J Biol Chem. Zhang X et. al. (February 2014). Regulation of DNA methylation by ethanol induces tissue plasminogen activator expression in astrocytes. J Neurochem. 128(3):344-9. Muren NB et. al. (November 2013). Electrochemical assay for the signal-on detection of human DNA methyltransferase activity. J Am Chem Soc. 135(44):16632-40. Liao W et. al. (November 2013). Enhancing bone marrow regeneration by SALL4 protein. J Hematol Oncol. 6:84. Lee H et. al. (August 2013). DNA methyltransferase inhibitor assay system based on the HBx-induced DNA methylation of E-cadherin. Biochem Biophys Res Commun. 438(3):540-5. Yara S et. al. (May 2013). Total parenteral nutrition induces sustained hypomethylation of DNA in newborn guinea pigs. Pediatr Res. 73(5):592-5. Gao F et. al. (October 2012). Differential DNA methylation in discrete developmental stages of the parasitic nematode Trichinella spiralis. Genome Biol. 13(10):R100. Tewari S et. al. (July 2012). Mitochondria DNA replication and DNA methylation in the metabolic memory associated with continued progression of diabetic retinopathy. Invest Ophthalmol Vis Sci. 53(8):4881-8. I use this assay for cancer chemotherapeutic purposes to determine the efficacy of my drugs to impact the epigenome. The procedure is fairly straight forward. I have noticed that following specific steps can be a bit challenging for my foreign colleagues due to wording choices in the protocol. I wish the different buffers/Abs/etc. were shipped at lower concentrations. Sometimes I only need to use 24-36 of the wells, which makes for awkward dilution quantities. All of the diluted tubes...there’s a lot! 2) There is a concern for how to determine internal HDAC and DNMT quantity (protein level) to normalize all samples.